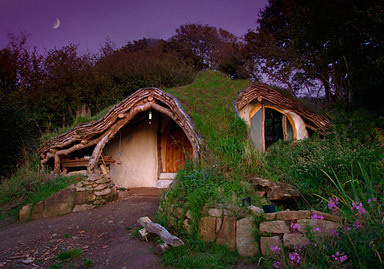 Long story short: guy named Simon and his father in law builds a low impact wooden house, it takes 4 months and £3000 and the effect is fantastic place to live which looks like hobbit hole. It has features like solar panels, fridge cooled by air coming from underground and water from nearby spring going down the hill. Check out his website for plans, pictures and more info!